I felt really elated when I received a mail stating that I am one among the few selected reviewers. My happiness multiplied on holding the book in hand. The devotion of suspect X written by Keigo Hashimo. The book was kick started by one of the protagonist – Ishigami. However, the fascination to read the book started fading as I turned the pages on and on. I thought that it was too descriptive. My reading pace proliferated. Eventually, l I started skipping sentences… But that happened only until the introduction of the beautiful single mother – Yusuko! Ishigami is portrayed as an extraordinarily brilliant mathematician. An ardent observer as well! And Yusuko is a single mother of a young daughter, Misato. She is constantly troubled by her ex-husband. 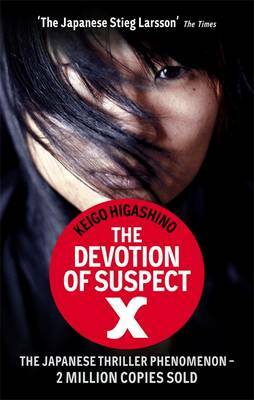 Things go out of control one night which brings an end to Yusuko’s ex-husband – Togashi. At the end of the first chapter you know the end of the story. You know who-killed-who and why. You also know how! Here starts the real story and I bet you will enjoy it. I am a kind of person who likes to watch a movie or read a book for that matter after knowing the tale. I enjoy in seeing how the story is narrated by the author. I like to appreciate intelligent and crisp narrative. I like to be led to the ultimatum – which I know beforehand. I was surprised because the book told the end. Unusual, isn’t it? We knew everything. We were merely expected to see the clever moves of the detective, Kusanagi and his advisor aka friend, Yukawa. The latter intriguingly happens to be an old friend of Ishigami. The aura of casualness makes the book more interesting. There is too much of Maths in the book. Come on... Ishigami is a High schol maths teacher. His knowlege is in depth and his love for the subject is evident. Well, I am one among the obvious lot who hates maths. I also think that algebra... differentiation and integration... and all other blah blah blah are just blah blah blah - A sheer waste of time! But, when a student expresses his aversion towards the subject, Ishigami explains the importance of subject in a layman's language. That explanation, indeed, did not ignite any desire towards the subject. But, it did not fail to make me think... Why a majority of people join hands under i-hate-maths-community!!! The translation into English is flawless and gripping. You certainly cannot ask for more. As you complete the book and keep it aside, you will be awed by the twist it had taken. It is claimed that about two million copies of the book is sold out. It is a no wonder. This is a completely different experience. This is a medium sized book. The title, of course! It is attractive enough to grab a prospective reader’s attention. But, that does’t really go with the plot, I say. You will definitely not regret it…!!! Very interactive and narrative kind of review: You know what I mean? Since you did not like the title, what would you rather call the book?